That’s not a good album title, is it? I remember snapping up Crying Steel’s 1987 debut On The Prowl, mesmerised was I by its cover and the metallic nuances contained within. Then they were gone, splitting up in 1990, only to return – well under my rock ‘n’ roll radar – in 2003. Since then and including this newbie, three albums have emerged, although the ship has never been steady due to numerous changes in the vocal department. Former TNT and Shy man Tony Mills is the commander on this opus, contributing guest lead vocals, and it is he who steers this ship into calmer waters. What you basically get here is rootsy, valiant 80s-styled metal with its leaden feet firmly in the middle of the road as this Italian troupe coughs up a panorama of ditties such as ‘Speed Of Light’, ‘Name Of The Father’ and ‘Crank It Up’, all of which are rather formulaic yet as enjoyable as the 80s! You know what you’re getting with these guys, because they’ve been there and done it. 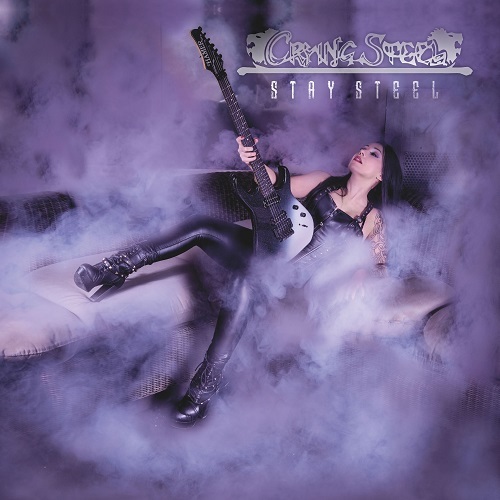 From its cover to its songs, Stay Steel remains steadfast in its approach, with driving hard and meaty riffs, solid percussion and Tony Mills’ warm, yet powerhouse vocals.